Scratch what I had planned on writing about today. I just wandered down for coffee and read in the newspaper about a program that is one of the most true WIN/WIN situations that I can imagine. 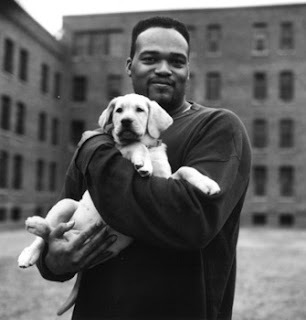 Puppies Behind Bars is a program that assigns puppies to qualified prisoners in several New York prisons to be trained as guide dogs, dogs for the disabled and explosive-sniffing dogs. Every prisoner battles low self-esteem and putting the past behind them. A dog offers unconditional love with complete ignorance of one's past and the program offers a prisoner the opportunity for accomplishment. The prisoners are taught a useful skill and could after leaving prison work in this field. They are offered additional information on possibly working as a veterinary assistant. Prisoners are giving back to society. The dogs are getting trained for a lower cost than if there were trained by professionals. More dogs get trained than would be possible relying on volunteers. With disabled veterans returning from Iraq, the need for dogs to aid the disabled is increasing. I urge you to stop by the full Puppies Behind Bars website to make a donation and receive further inspiration and positive feelings for the day!